Just when the property market at large faces a standstill in terms of trade activity, Bahria Town has launched forms for 8 marla commercial plots in Civic Zone, Bahria Enclave Islamabad. To many, this may appear to be a bad move on the part of the developer as the market currently has a limited number of buyers. The registered agents of Bahria Town, on the other hand, are of the view that this deal has rather attracted buyers who are not up for paying heavy taxes otherwise. These agents also believe that the tax mechanism doesn’t hurt investors of Bahria Town, especially those interested in plots in Bahria Enclave. While this may be debatable, the fact remains that the new tax regime hasn’t hurt Bahria that badly. The new deal includes more or less 50 forms for 8 marla commercial plots and is offered on first-come-first-served basis. Per the details, buying one of these forms will cost you PKR 30 million but, after booking the plot at PKR 7 million, the remaining amount can be paid over the next 2 years. Furthermore, since these are fully developed plots, possession will be offered right away. Location wise, these commercial plots are worth the money as they are located just opposite the Bahria Town Office in Bahria Enclave. The developer is yet to share details about the last date of submission of these forms, which might be 2 or more months away. Meanwhile, it is expected that these forms will be traded in the market, flipping hands and increasing in value in terms of the asking profit, also known as own or on. Bahria Town has been able to sell about 40% of the issued forms so far. The Bahria agents believe that it will take a while before the deal is sold out as these plots are commercial and come with a price tag too high to attract a bigger chunk of buyer and not because there is a shortage of active investors in the market. Many genuine buyers and active real estate investors have very valid concerns about the new tax mechanism and, in some cases, they are also not sure how some of these taxes would actually be calculated. Federal Board of Revenue might also revise its valuation tables and have a louder say in fixing the Deputy Collector rate throughout the country. 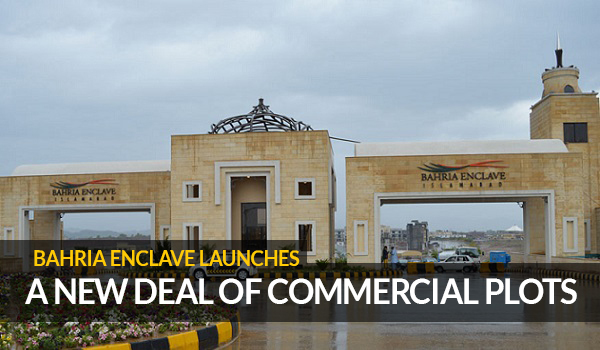 In such circumstances, if Bahria Enclave has managed to keep buyers interested, that is definitely a big deal.